One of the first people to fall in love with Seville was the poet-king Al-Mutamid, and the city's ability to dazzle has not abated since. It takes a stony heart not to be captivated by its exuberant atmosphere - stylish, confident, ancient, proud, yet also convivial, intimate and fun-loving. Plaza de Espana Sevilla Our 4-Star classification designates those properties with well-appointed, deluxe accommodations, extensive amenities and comprehensive guest services. Expect attention to detail and a warm and hospitable staff ready to cater to your needs. These superb properties offer a truly refined getaway. 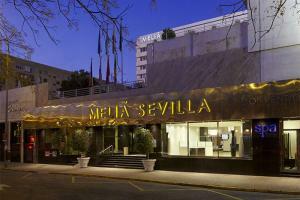 Featuring a privileged location opposite Plaza de Espana, Melia Sevilla offers upscale accommodations with easy access to public transportation and popular attractions. Catedral del Sevilla Our 4.5-Star classification designates those properties with well-appointed, deluxe accommodations, extensive amenities and comprehensive guest services. Expect attention to detail and a warm and hospitable staff ready to cater to your needs. These superb properties offer a truly refined getaway. 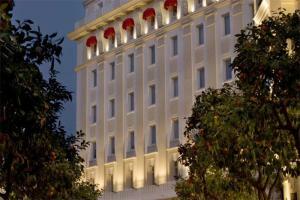 Half star indicates that the hotel/resort meets all criteria of the designated rating and exceeds in certain areas. Set in the historical, commercial and financial heart of Seville, Gran Melia Colon, combines timeless luxury with avant-garde flair. Catedral del Sevilla Our 3-Star classification designates those properties where guests experience an ideal mix of comfortable accommodations and modern amenities. 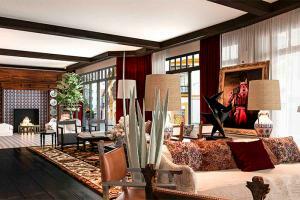 Most of these hotels feature a variety of services, and offer distinguished style and comfort. With its traditional Arabian and Andalusian architecture, this boutique hotel in the heart of the city, reflects the soul of Seville. Catedral del Sevilla Our 4-Star classification designates those properties with well-appointed, deluxe accommodations, extensive amenities and comprehensive guest services. Expect attention to detail and a warm and hospitable staff ready to cater to your needs. These superb properties offer a truly refined getaway. With an historic city center location, this hotel is inspired by the stately homes of Seville and embodies the essence of this metropolis. 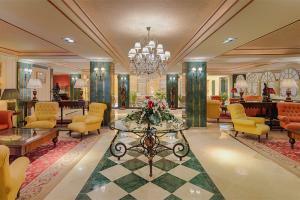 This magnificent hotel in the heart of Seville has been fully restored while retaining its aura of history and glamor.